If you’re doing any traveling with your laptop this summer, or even if you’re just toting it between home and the office, keep it safe in transit. Often customers will come into the shop carrying a laptop in a regular backpack, cloth shopping tote, or plastic grocery bag, but these are not sufficient laptop cases to protect your portable device from physical damage. If possible, the best way to transport a laptop is in a padded case specifically designed for laptops, with a strap to secure it in place so that the device doesn’t jostle around inside. They can come in the form of backpacks, briefcases, messenger bags, and top-loading bags. These specialty bags usually include special pockets or sections for your charger, flash drives, smartphone, and other electronic accessories, conveniently keeping everything together. As you purchase a laptop case, consider where and how you’ll be using it to make the best decision about the material, weight, style, handles/straps, and design. 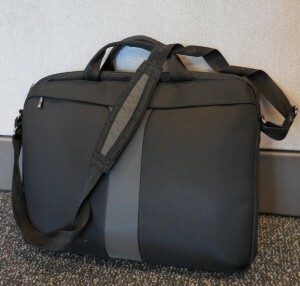 • Use provided straps or cords within the bag to secure the laptop so that it’s not loose and jostling around. You want a snug fit, without extra space, so choose a size appropriate to your laptop. • If storing in a regular bag or backpack, keep the laptop in a padded sleeve at least, and limit its movement by stacking other sturdy or padded objects around it (e.g. books, binders, rolled up clothing, etc.). • Don’t toss around any bag holding a laptop. Students especially tend to do this with laptops in backpacks, letting it slide from a shoulder to the floor, but this greatly increases the risk of both external and internal physical damage. • In the car or other vehicle, place the bag in a position that is stable and not likely to shuffle around or fly off a seat at a sudden stop. On the floor or sandwiched between other bags are options. • If going through airport security, make sure the laptop is easily accessible. Put all your other things (shoes, jacket, and liquids) in other bins before the laptop. Make the laptop bin the last one to go through the scanner so that you’ll be on the other side to retrieve it. • Don’t store your laptop in a plane’s overhead compartment, as bags can easily slide out. Keep it under your seat, which will also make it easier to access. • If you’ll be carrying the bag around a lot, make sure it has a comfortable, sturdy shoulder strap, one that is thick enough to distribute the weight. • Understanding that damage is possible no matter how careful you are, you might want to consider using a secondary laptop or tablet if you have one. Keep your primary device at home with all your important data, and use an inexpensive model to access the Internet and save your photos while on your trip. Just a few, simple care tips will help protect your laptop, across the globe or across town. If you’ll be doing some online shopping and are trying to decide between a thin laptop sleeve or an entire laptop bag, this article from eBay describes various tote types. See more tips on selecting the right bag in this article from TechRadar. "Thanks for the great service and courtesy!"